The Student Accounts tab allows access to your tuition and housing bill via a link to your MAX account. Students and parents can now access real-time, student account information by clicking "Launch MAX Pay" from this page. The Financial Aid tab allows access to current semester financial aid awards, financial aid document tracking, and accepting aid and uploading forms. The Records tab allows access to your current semester course schedule and unofficial transcript. The Academic Advising tab allows access to your degree progress, gpa projection, advisor meetings, and major exploration. The Registration tab allows access to MCAD’s Disclosure + Enrollment Agreement, course search, and semester schedules. In compliance with the Family Educational Rights and Privacy Act (FERPA) of 1974, this Release of Information allows you as the student to grant access to your Student Account information, Financial Aid, on-campus housing contract, and/or Records to any individual you choose. There is a Quick Links bar on the left which includes external links to reference sites such as Lynda.com and student accounts such as Blackboard. Where is my Online Transcript. Login to your myMCAD account. Why did I receive an email about being granted access to an MCAD student’s information? An MCAD student has chosen to grant you access to their student account information, financial aid, records, and/or housing information. You will receive an email from the MCAD Records Office once your account request has been processed (please allow 2-3 business days to process Parent/3rd Party access requests). This email will include a link to create a password in order to login and access the student’s information. 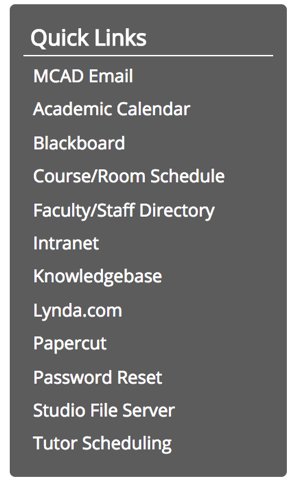 Once your password has been saved, go to intranet.mcad.edu and click the “Login to my.mcad.edu” button, located near the top of the page. To login, use the email address from which you received the access invitation as your username, and enter the password you created. Once you have successfully logged into myMCAD, click the ‘Student Info’ tab to access the student’s information. Pursuant to the Family Educational Rights and Privacy Act of 1974 (FERPA), students 18 years of age or older may restrict access to their educational information. For more information, please visit FERPA online. If you have any questions, please contact the Records Office @ 612-874-3727 or visit them in M103. If you run into any issues logging in, please visit this link here.